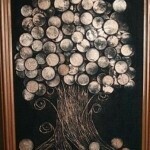 Excellent material for many craft projects are coin — domestic, foreign, new and old. 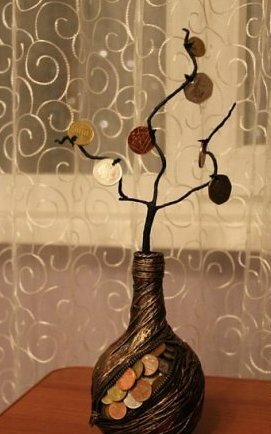 Decoupage bottle of coins is not only a beautiful decoration, but also a great gift for many holidays. Coin, a gift for the New year, has always been considered a symbol of wealth and material prosperity in the coming year. 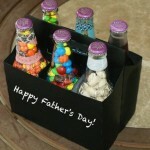 Therefore, decoupage bottle with coins (or not) is not only very beautiful craft that allow to make good father’s day day or mother’s day, but also very symbolic souvenir. Bred in an equal ratio of PVA glue and water. Cut a piece of paper towel right size, wetted it in the resulting solution, a little squeeze and sticking to the surface of the bottle. The surface relief formed themselves, straightening towels fingers. 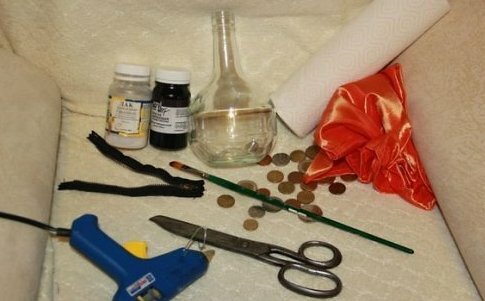 Make little flagella from towels and wrap them around the bottle. 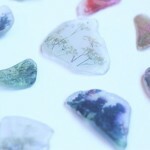 Next you need to dry the resulting billet. 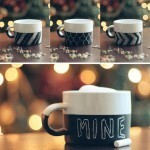 After the first drying, use black acrylic paint to color the surface of a bottle. Then let it dry again. 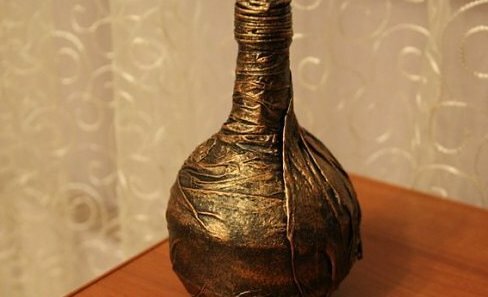 On sponge apply a bit of bronze paint and “spanking” apply bronze on the bottle. On top of the paint apply the varnish. 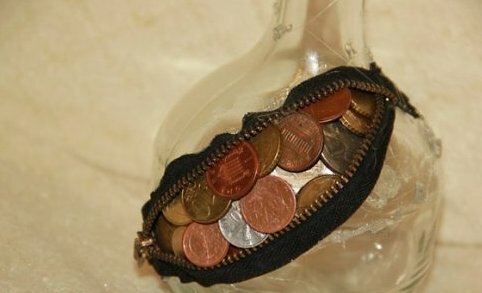 In General decoupage bottles coins can be completed, especially if you plan to use it properly and fill it with any drink. 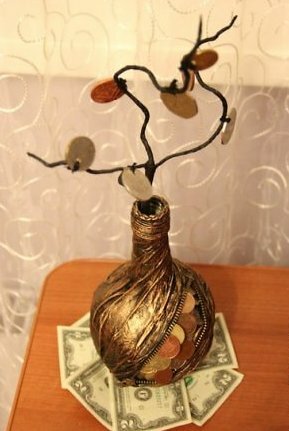 But if you plan to use it only as a decoration, small but just a necessary addition can be a money tree growing out of bottle. Make tree from wire. The shape of the branches and size of your choice. The connection of the branches to the trunk fastened with tape. By analogy with the bottle, the branches should be glued with towels, dry them and paint them with black paint. Apply a Matt varnish on top of the paint. 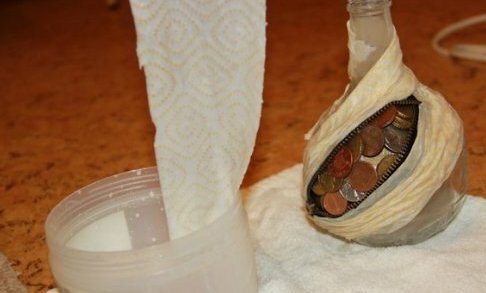 Use a drill to make holes in the coins. 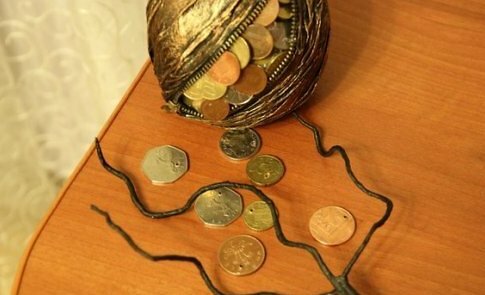 Use ribbons or pieces of wire to tie the coins to the branches of the tree. 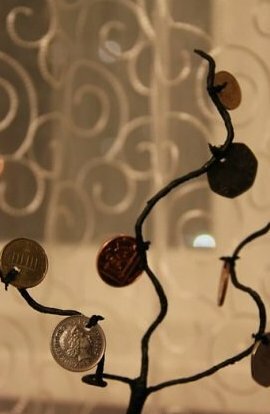 In our example they are screwed in pretty tightly, but you can make the hanging branches of the coins. 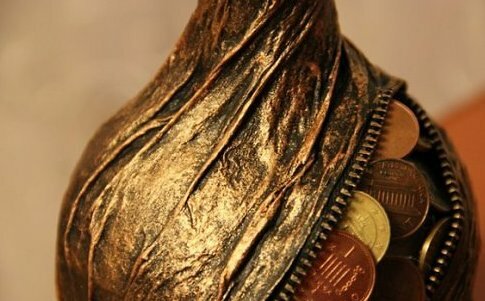 It remains to attach the branch to the bottle — decoupage bottle of coins is completed. 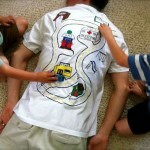 This toy can also serve as home decoration, element of decor, so become a souvenir on a holiday, such as father’s day or mother’s day.